The CMFNH team has updated the design charrette policy. All projects at the design or construction phase are eligible to receive a $1,500 incentive for participating in a design charrette. An extra $3,500 incentive is available to projects that implement any of the efficiency measures suggested during the meeting for a total of $5,000. CMFNH provides up to $5,000 for project design charrettes. An early design charrette to review the energy efficiency goals of a project is eligible to receive either a $1,500 or $5,000 incentive (paid to the developer). The $1,500 incentive is available for any CMFNH enrolled project that participates in a program hosted design charrette. An extra $3,500 (total of $5,000) incentive is available for a project that makes any of the program-approved efficiency changes suggested during the design charrette. To receive the design charrette incentive, the charrette must include, but is not limited to, the developer, architect, mechanical engineer, energy consultant, general contractor, HERS rater, and a TRC representative. Charrettes may occur in-person or over a conference call, and should include representatives from other programs that the project may be participating in, such as Build It Green’s GreenPoint Rated or New Solar Homes Partnership. The meeting is used to discuss and formalize the energy efficiency strategies of the building including the common areas. The design charrette will draw upon the knowledge and expertise of all participants. 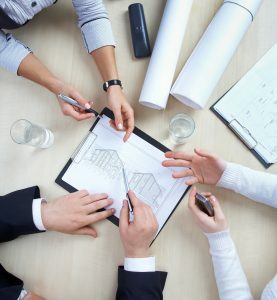 To facilitate a successful design charrette, the project must be at a design or construction phase where efficiency measure changes can still occur. If, for example, the project has started construction and purchased all the mechanical equipment already, the project is not eligible for the design charrette incentive. At that point in construction, suggestions from the charrette will not be possible to implement. To avoid ineligibility for this incentive, please involve CMFNH staff as early as possible in the project design.